Filed to: Are you kidding me?Filed to: Are you kidding me? 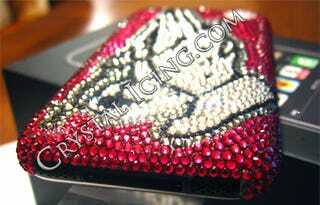 Crystal Icing, known for covering various electronics in Swarovski crystals, offers an iPhone given the same treatment. For $295, you can get your phone "iced" with 1,500 regular-sized crystals, or 3,000 really small ones. Patterns range from butterflies to "tons of flowers" to flames. Or even camo, for you tough guys with an eye for fashion. If you don't like any of their premade patterns, you can request a custom way to ruin your phone. You know, because doing this to your iPhone, you've got to hate it. Or maybe you just hate money. Surprised? You really shouldn't be. Swarovski crystals can be found all over stuff like Xbox 360s and pepper spray. Older phones, like the Sidekick, enjoyed quite a bit of success once studded with Swarovski crystals, snagging the likes of Paris Hilton. Icing up a hot item like the iPhone was inevitable, and now tragic.